Five Reasons Why the Space Age Is Just Beginning. And This Time It’s for Real. The Economist is wrong. The space age is not ending. It is just beginning. And it is taking off fast. Its next giant leaps will change the nature of resources, energy, jobs, and the economy. The leap will make your grandkids lives so different from yours and mine that it will defy belief. But this time, the future is not driven by NASA, it’s propelled by private enterprise. The players are small companies. But what they lack in fame, they more than make up for in spirit…and in smarts. Below are five companies working diligently to bring humanity closer to the dream of permanent settlement in space. Robert Bigelow made his reputation, and his money, building Budget Suites of America. His thirteen year old company, Bigelow Aerospace, is putting hotels in space. Bigelow’s first 1/3 scale prototype inflatable habitat — complete with thirteen cameras and systems to maintain air pressure, oxygen content, and temperature (all systems powered by solar panels) — has been in orbit since 2006. It carries “guests” — Madagascar hissing cockroaches, and Mexican jumping beans from Bigelow Aerospace’s neighborhood in the desert of Nevada. It also carries an entire Gensat microsatellite from NASA. Bigelow’s second space hotel prototype went into orbit in 2007 with improved systems, 22 monitoring cameras, and more sophisticated guests — scorpions and an entire colony of seed-harvester ants. 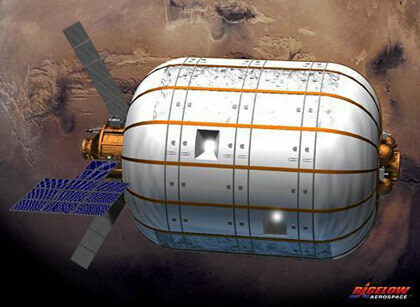 Bigelow’s plan is to offer far more living space than the International Space Station at a fraction of the cost. 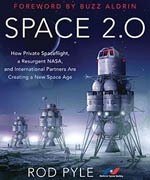 Bigelow already has a list of seven countries waiting to occupy his space hotels. The pace of demand has increased to the point where the company is constructing its third habitat, the BA 330, ahead of schedule. It plans to have the BA 330 in orbit in 2014 or 2015. Space Exploration Technologies, or SpaceX, was founded in 2002 by PayPal co-founder Elon Musk. Musk defied all expectations by successfully building the Falcon 1 and Falcon 9 rockets. The Falcon 9 cost $400 million, which is a mere fraction of the cost of the Space Launch System — an overpriced rocket being pushed by Congress. Musk has also built the Dragon capsule — which in December 2010 became the first spacecraft ever placed in orbit and recovered by a private company. The Dragon Capsule is capable of carrying seven passengers or a launch payload of 13,000 lbs. But on its maiden voyage, the Dragon Capsule carried a secret payload, later discovered to be a wheel of cheese — an homage to a Monty Python Cheese Sketch. Upcoming is a super rocket called the Falcon Heavy, built on the base of the successful Falcon 9. It will use nine Merlin engines and carry 117,000 pounds to low earth orbit or 41,000 pounds to geosynchronous orbit. It will do something even more crucial: drastically reduce the cost of space access. In the Shuttle era, it cost us between $10,000 and $14,000 a pound to get humans and cargo into space. That’s much too much. If we can drive that cost down, the riches of space will open. Drive that cost down and we can deliver more solar energy from space than all the energy mankind has used to date. We can also mine space resources like platinum, lithium, and rare earth metals — the key materials for electric cars. And we can even build resorts in space. The Falcon Heavy is expected to drive the cost per pound to orbit down from $14,000 a pound to less than $1,000. This is something the traditional space industry experts said cannot be done. And Musk is aiming to use the Falcon Heavy to send humans and supplies to the fourth planet from the sun. 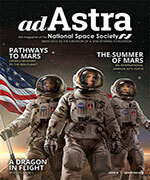 “We’re going all the way to Mars,” he said at the National Press Club on April 5th, 2011. 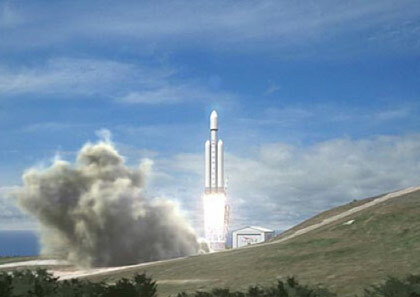 “I think… best case 10 years, worst case 15 to 20 years.” The first demo flight of what will be the world’s most powerful rocket is expected in 2013. XCOR was founded in 1999 by former members of Rotary Rocket — a company who wanted to combine a helicopter with a rocket. Jeff Greason, XCOR president, is also a visionary whose recent keynote speech at the International Space Development Conference is considered a major statement in space policy. 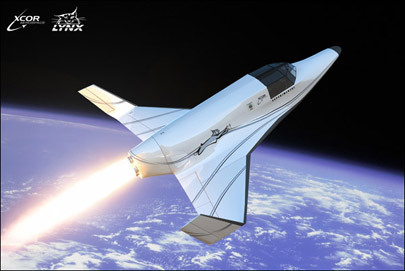 XCOR’s pride is the Lynx, capable of bringing people and science to the edge of space. The Lynx is a two-seated, piloted space transport vehicle that will take humans and payloads on a half-hour suborbital flight to 100 km (330,000 feet) and then return safely to a landing at the takeoff runway. It takes off and lands like an aircraft, but runs like a rocket. And it will allow up to four flights per day. Sales for the Lynx have surged. As of May, 2011, XCOR has sold approximately one hundred tickets costing $95,000 each. But XCOR is also working with United Launch Alliance on building a new upper stage for the Atlas 5 and Delta 4 rockets. And, they are also working with the Planetary Science Institute to carry the Atsa Suborbital Observatory. The Lynx Mark I is expected to begin test flights in 2012. 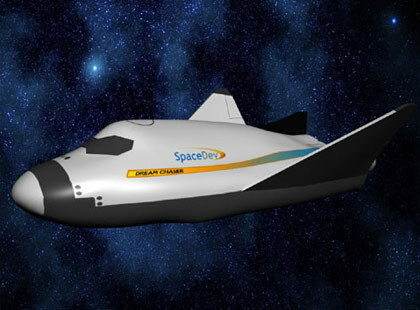 Their vehicle, the Dream Chaser, looks a lot like the shuttle because it was originally a NASA design. It will launch atop an Atlas V and return from space by gliding and landing at almost any aircraft runway in the world. It will be capable of holding a crew of seven people. Its missions will include delivering and returning crew and critical cargo to the International Space Station. Sierra Nevada’s current timetable calls for suborbital test flights starting in 2013 and orbital tests in 2014. Blue Origin was started by Amazon founder, Jeff Bezos. The company’s motto, Gradatim Ferociter means, “Step by Step, Ferociously,” and might hint at Bezos’ plans. After all, Amazon has become more than just the world’s largest bookseller. Blue Origin’s New Shepard is a rocket-propelled vehicle capable of carrying multiple astronauts into suborbital space. Along with providing spaceflight opportunities to the public, it will also allow researchers to fly experiments into space and a microgravity environment. It is based on the earlier Delta Clipper (DC-X). The vehicle consists of a pressurized crew capsule (carrying the astronauts and experiments) which sits atop the propulsion module. Flights will take place from Blue Origin’s own launch site, which is already operating in West Texas. New Shepard will take-off vertically and the crew capsule will land softly under a parachute at the launch site. A scaled-down “Goddard” test vehicle has been flown. This article only highlights five companies. There are more, including Virgin Galactic, Armadillo and a host of others in the minds and planning stages of enterprising people around the world. The Economist is wrong because space is the next logical step for humanity. Exploring and settling new frontiers is what we’ve been doing for the past two million years. There’s no reason why we would now suddenly come to a screeching halt. The current period is of necessity, just a temporary lull in space activity. We must all get fully involved in due course. The eventual survival of our civilization depends upon becoming an extra-terrestrial universal civilization. In the most stark words it is “do or die.” So, let’s get the economy going again, get all the major nations involved, develop the necessary means for interplanetary and interstellar travel, and go for it. The Falcon 9 has 9 engines in the first stage, and 1 in the second stage. The falcon heavy puts together 3 first stages of the F9. So, the Falcon Heavy has 27 engines in the first stage. In addition, it does something unique. The 3 stages are tied together. Initially, the 2 outer fuel tanks feed all 27 engines, while the center tank is not used. Once it hits a certain altitude, the 2 outer cores drop, which leaves the center core with 9 engines, full tanks, and quit a bit of speed and altitude. That is why it takes up 54 tonnes, rather than 45, which is all that it could do without that crossover. You have XCOR as a company to watch but do not mention Virgin Galatic? I believe Branson will be launching before XCOR. Vladislaw, I disagree. If only there was somewhere we could place bets.